Dr. Picard now uses advanced digital technology in his practice to evaluate patients' postural health. The AssociateTM, an electronic scanner developed by the nation's leading orthotics producer, Foot Levelers, Inc., was recently installed at Picard Chiropractic. 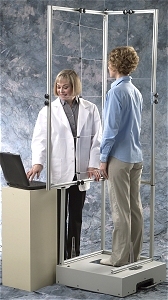 The new scanner enables the doctor to screen for foot imbalances that affect overall body function. This technology helps chiropractors develop care plans and use postural support for improved results.